NVIDIA® Nsight™ Systems is a system-wide performance analysis tool designed to visualize application’s algorithm, help you select the largest opportunities to optimize, and tune to scale efficiently across any quantity of CPUs and GPUs in your computer; from laptops to DGX servers. The ultimate development platform for heterogeneous computing. 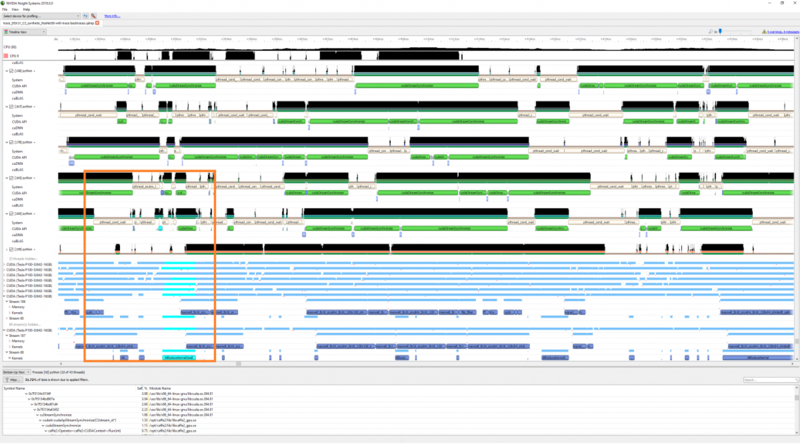 Work with powerful debugging and profiling tools, optimize the performance of your CPU and GPU code. Find out about the Ecilipse Edition and the graphics debugging enabled Visual Studio Edition. This is a cross-platform performance profiling tool that delivers developers vital feedback for optimizing CUDA C/C++ applications. First introduced in 2008, Visual Profiler supports all CUDA capable NVIDIA GPUs shipped since 2006 on Linux, Mac OS X, and Windows. This is a profiling and tracing toolkit for performance analysis of hybrid parallel programs written in CUDA, and pyCUDA., and OpenACC. A performance monitor which comes with CUDA, and PyCUDA support to give detailed insight into the runtime behavior of accelerators. Enables extensive performance analysis and optimization of hybrid programs. A hardware performance counter measurement technology for the NVIDIA CUDA platform which provides access to the hardware counters inside the GPU. Provides detailed performance counter information regarding the execution of GPU kernels. (CUPTI) provides performance analysis tools with detailed information about GPU usage in a system. CUPTI is used by performance analysis tools such as the NVIDIA Visual Profiler, TAU and Vampir Trace. Looking for expert advice on optimizing your GPU code or identifying opportunities for GPU acceleration in your application?